Undoubtedly there are many people in the world who have actual claims to greatness, to fame and fortune: people who hail from families that, by birthright, have a certain lineage that includes the social elite. The Kennedy and Rockefeller families come to mind. My family does not. However, things might have been very different had my great, great grandfather, who built a publishing empire of sorts, not been sued by Encyclopedia Britannica over alleged copyright violations. He won the lawsuits, but the legal fees left him nearly broke, and thus ended The Werner Printing and Lithograph Company and any hopes of fame and fortune for future generations of this Werner family. In previous entries on this blog I’ve made clear here and here that I do not hail from the other Werner families that have attained fame and fortune for various corporations bearing my last name the same last name as me. But there was a time. Because of his esteemed position in society, my great, great grandfather personally knew the likes of Queen Victoria and Buffalo Bill Cody. He was said to have made a personal loan to his friend, Frank A. Seiberling, to help Seiberling start a certain business in Akron, Ohio (the Goodyear Tire and Rubber Company). He could have asked for a small stake in the company, but he did not. Things could have turned out very differently had he done so. There’s actually quite a bit of historical reference material written about him because of the impact he had on Akron’s early industry. I find it ironic that the day on which I discovered this article in the Akron & Summit County blog was also the 82nd anniversary of my great, great grandfather’s death. If you’re remotely curious, I wrote about my great, great grandfather, P.E. Werner, here. Family histories are full of ups and downs, but who we are today is what really matters. And while it makes no sense to live in the past, it’s fun to research the olden days. To that end I was recently going through old photos that have been stored in my dad’s basement for decades. I’d seen many of these photos before, but this time I spent a greater amount of time and interest looking through them and writing down dates. With my dad present, I was able to hear some interesting stories behind some of the photos. One photo in particular caught my attention. My grandfather, Albert Richard Werner, is seen when he was a young man in his 20’s wearing his Akron University letterman’s sweater. He’s holding a respectably-sized pike (or perhaps a muskie) that he caught on a fishing trip somewhere in the proximity of Akron, Ohio. I don’t know that my grandfather was what one would consider an avid angler, but he obviously fished occasionally, as evidenced by this photo. As we looked through the photos my dad told me a story that had been passed down to him from his father: On a particular fishing trip, my grandfather and a buddy encountered mechanical problems with their powerboat, and they were essentially stranded in the middle of a lake. My grandfather had to dive into the water to perform some sort of makeshift repairs the prop of the boat belonging to his buddy, Bill Pfleuger. Yes, that Pfleuger– the name behind the well-known fishing tackle. 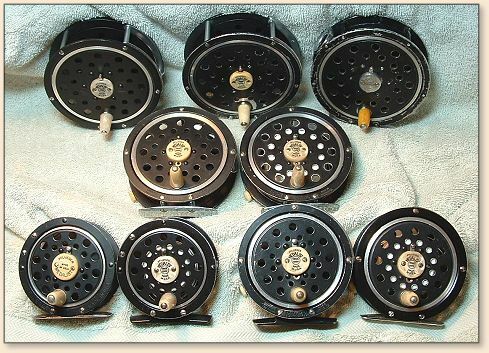 I’ve never given much thought to the Pfleuger brand, although I know many regard highly the Medalist fly reels. Curious about my grandfather’s fishing buddy, I did a little internet sleuthing and found ample reference to a William S. Pfleuger, whose father Earnest A. Pfleuger started the famous company. The Bill Pfleuger in question would have been born around 1903– a generation younger than William S.Pfleuger. I wasn’t able to find any information, but perhaps a descendant will read this and contact me. Who knows, maybe one of the unidentified young men in some of the photos I have is their ancestor. Stranger things have happened. It’s amusing to think that if things had turned out differently for my forefathers this blog might have been titled, “The Accomplished Angler.” Such is not the case, and that’s all fine and dandy. We cannot change the past and it’s best to let bygones be bygones. That being said I will not soon be going out to purchase a set of Encyclopedia Britannica, but I am tempted to seek out a vintage Medalist. After all, my grandfather fished with a Pflueger. Maybe I should, too. I think my forefathers would approve of both decisions.